We present you with this amazing new extension with Full HD wallpapers of the Thanksgiving. HQ Wallpapers and Backgrounds for your unique and colorful browsing experience. Find out about facts about Thanksgiving with all these amazing wallpapers while browsing! The first Thanksgiving – a celebration of good harvest – took place in 1621 when English Pilgrims at Plymouth Plantation in Massachusetts shared a meal with their Native American neighbors. However, historian Michael Gannon argues that the first Thanksgiving celebration in North America actually took place half a century earlier, in Florida. So on 8 September 1565, he says, following a religious service, Spaniards shared a communal meal with the local native tribe. According to the US National Archives, on 28 September 1789, the first Federal Congress passed a resolution asking that the president of the United States recommend to the nation a day of thanksgiving. And a few days later, George Washington issued a proclamation naming Thursday 26 November 1789 as a “Day of Publick Thanksgiving” – and the first time Thanksgiving was celebrated under the new Constitution. 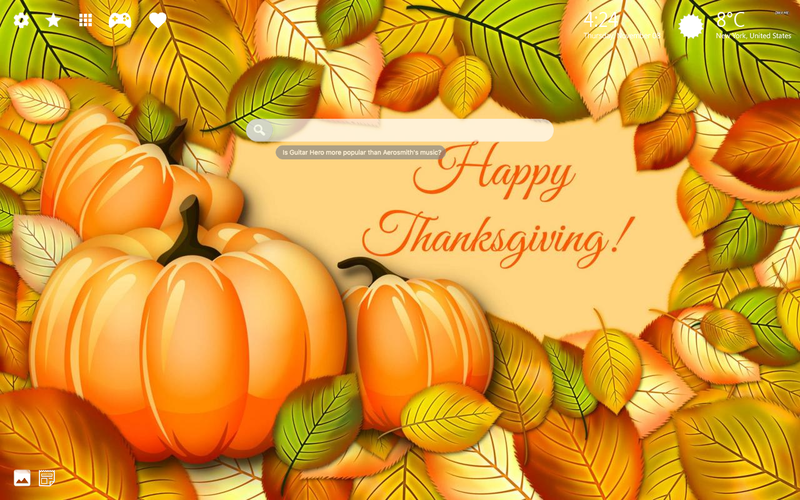 We have added cool features to this Thanksgiving 4K Background Theme extension which will enrich your browsing experience and fill your day even more! 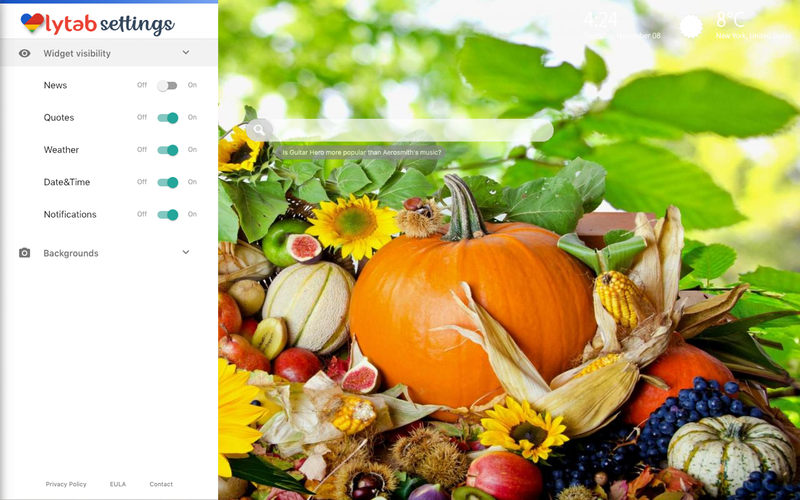 Thanksgiving 4K Background Theme extension provides you with a local time option wherever you are. Therefore, you will always know the accurate time. Thanksgiving 4K Background Theme extension is accurate, so your weather will match with your current destination. We present you the option to bookmark your favorite websites, stores or whatever with the bookmark option provided by Thanksgiving 4K Background Theme extension. Therefore, you can also quickly access to recently seen websites with one click. Be inspired every day, because Thanksgiving 4K Background Theme extension provides inspiring quotes and amazing facts every time you open a new tab. 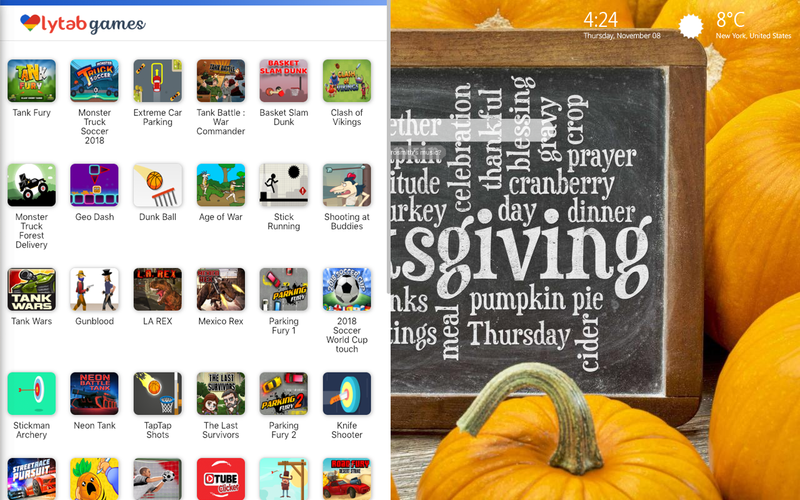 Thanksgiving 4K Background Theme extension has many, many great and funny games you can play for free while you are browsing. This Thanksgiving wallpaper is simple to install and you can install it again. 5. As a result, your extension (in this case, Thanksgiving 4K Background ) is removed from your list in Chrome browser.